Must love water views & extreme privacy! South CarolinaGÇÖs most desired waterfront property, this compound is at the end of a peninsula with 270 degree water views . Self-sufficient and gated within the exclusive member-owned community of Spanish Wells, it boasts a magnificent home thatGÇÖs designed for entertaining, relaxing and activities. A Kohler 100KW generator serves the entire estate, with its own deep water dock and RV hook ups. Land your helicopter on the point or dock your 100GÇÖ yacht at one of two docks. This is 2 lots: #82 with the home and the point is #83 to build a guest house to complete the compound or as a second property. RARELY AVAILABLE. Magnificent luxury home on Brams Point Peninsula where you have sunrise & sunset views! House views Calibogue Sound in front & Broad Creek in the back w/private concrete-piled dock w/large elevated deck. 24/7 water. Updated in 2016. Grand entrance w/35' foyer ceiling. Formal dining room. Living Room/Dining Area w/fireplace. Kitchen opens to breakfast area. Luxurious master suite w/gas fireplace & sitting area w/water views on both sides. 3 bedrooms on 2nd floor. 2 bedrooms on top level. Exercise Room. Sauna. Beautifully landscaped grounds with award winning tropical oasis pool & 3 separate outdoor living/entertaining areas. This sound front Spanish Wells home exudes charm & welcomes you with its beautiful Low Country/French Provincial style & its warm & stunning interior with direct water (and sunset) views from every room. Situated on over an acre, this updated home boasts a chefGÇÖs kitchen, hardwood, 2 fireplaces, 1st floor master, gorgeous master bath, 2 en-suite large guest BRGÇÖs on 2nd floor, brand new 3-car garage & spacious in-law suite, a brand new private dock & the most lovely expansive yard in all of Spanish Wells, perfect for entertaining with large pool deck & lawn area & rose & vegetable gardens galore. A standout in a coveted neighborhood. Deep water Sound Views to May River. Custom designed house on 3 acres w/private dock. Well-appointed kitchen with s/s appliances including a 6-burner gas cook top. ButlerGÇÖs Pantry w/wine cooler. Kitchen opens to eating area & family room. Separate LR & DR. 2 fireplaces. 1st flr Master suite w/luxurious marble bath w/walk-in shower, slipper tub and his & her walk-in closets. 3 spacious guest ensuite bedrooms up plus office/play area. Features include wood shake exterior, antique Heart Pine flooring, wainscoting, smooth ceilings, cedar closet, crown molding/trim work & 16.2 elevation. 3 car side entry detached garage w/golf cart area. Htd pool. Overlooking the Broad Creek tidal basin near the point in Spanish Wells is a custom-built deep-water residence that defines both luxury and causal living with incredible views for miles. Soak in the natural beauty of the Lowcountry from almost every room and a terraced pool/waterfall with gorgeous landscaped grounds. This home boasts tumbled stone floors, hand scraped hardwood, coffered ceiling, open floor plan, two family rooms, fireplace, and a custom chefGÇÖs kitchen featuring Calcutta Gold honed marble. The private dock features a 12,000lb lift, twenty-foot floating dock, jet ski lift, and a dining/sunning deck. 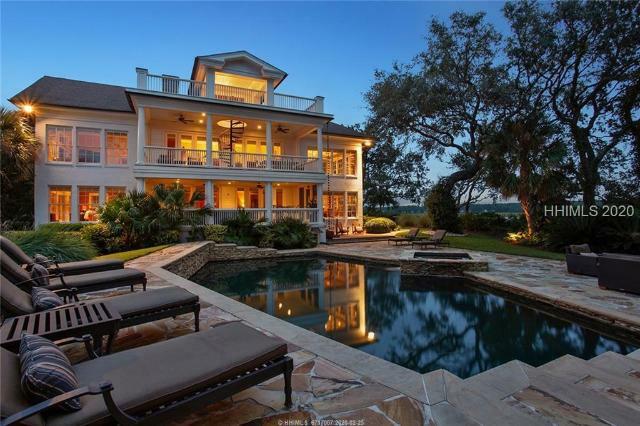 An open floor plan allows for Water views from every room in this Spanish Wells Plantation home. The first double waterfront property located on Brams Point uniquely featuring a private beach. This high 1+ acre property is on the Calibogue sound where you have a secret, sandy beach. The backyard fronts on the protected deep waters of the Broad Creek with a deep-water dock that will accommodate yachts up to 65 feet. There is plenty of water, over 12 feet at low tide. Premium Homesite, in a private plantation community! You'll enjoy amazing sunrises and sunsets from this 1.08+ acre lot in Spanish Wells with deep water boat access from the new floating dock! This ideal building lot sits on a high elevation of almost 17 feet on the Broad Creek side of the Calabogie Sound. Build your Dream Home here and enjoy the fantastic views! The only NEW build for sale in Spanish Wells! Southern LivingGÇÖs 2019 Favorite Floor Plan comes to life in this stunning Lowcountry farmhouse. 5-bedroom, 4.5 bath, features custom touches throughout. Open living/dining/kitchen concept, master suite, home office, outdoor living area, breakfast nook, butlerGÇÖs pantry and detached 3 car garage with guest suite above. House sits on over an acre with beautiful live oaks framing the backyard for expansive fairway views of the 5th hole of the Spanish Wells Golf Course. Finishes to include hardwood floors, marble countertops and tile work, custom cabinets and more. STUNNING PRIVATE RESIDENCE ON 1.5 ACRES! Boasting 20' ceilings, coral-style floors, handcrafted doors, arches, elegant columns & tall windows. The home is ~5,800SF, yet lives comfortably with a remarkable flow. Custom interior features & exquisite details throughout. The Kitchen centers around a (gas) Thermador range encased by an arched brick surround. The family room is enhanced by exposed beams and vaulted ceilings. The "in-law" suite features separate entrances, living area, bed & bath, laundry, and full kitchen...flexible space for extended family, guests, office or gym. Plus a (42GÇÖx15GÇÖ) courtyard pool, secluded by mature landscaping. This cottage style home w/a park-like backyard & 2-car garage has gorgeous lagoon & golf views for enjoying beautiful sunsets. Bistro style kitchen in the main house w/granite & stainless steel appliances & opens to the living area, complete w/wood stove. The master suite has large bath & screened porch. The 2nd BR is private w/its own bath. The detached guest house has its own LR, kitchenette, full & 1/2 BA. Brand New HVAC installed in 2019. This small, centrally-located community has pool & easy access to the Intracoastal Waterway, beaches and shopping. $15,000 CREDIT for UPDATES at closing w/acceptable offer, SELLER IS MOTIVATED!